Deck the Hall is the perfect way to make your family’s holiday season merry and bright. 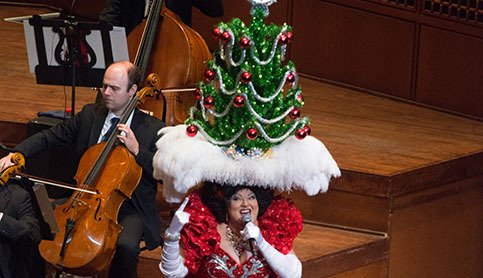 Enjoy a concert of festive favorites and sing-alongs with members of the San Francisco Symphony, guest artists, and special appearances by beloved holiday characters. Tickets include post-concert festivities with entertainment, arts and crafts, and refreshments. To make the experience even more memorable, order a VIP package that includes premium concert seating plus an exclusive, fun-filled pre-concert party with treats, holiday crafts, games, and a photo with Santa! Top VIP packages include an invitation to the Davies Symphony Hall Tree Lighting on November 29, 2018. Call the Volunteer Council for details at 415-503-5500. Proceeds from this event support Deck the Hall Community Day, which invites 4,000 children from public programs to this holiday concert free of charge, providing many of them with their first opportunity to visit a concert hall and hear a live orchestral performance, as well as the San Francisco Symphony’s education and community programs. Ticket exchange and group discount not available.